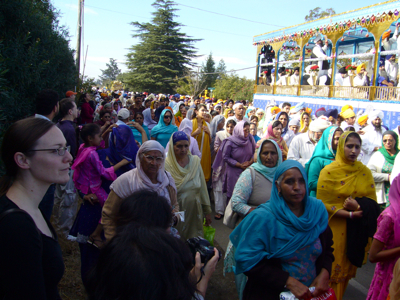 Every year, on the first Sunday of November, tens of thousands of Sikh from across the U.S. and Canada travel to Yuba City for the largest gathering of their extended community in North America. It’s the only public festival I’ve seen in this country where not a single piece of food is sold, yet I still managed to eat and drink for six hours straight. A recent lunch with a caravan of hungry friends reminded me of the insurmountable difference between eating in America and eating in Vietnam. Even when the food is excellent, even with folks I love, even when the weather is as freaky hot as it’s been this week. Expansive menus, with dishes numbering into the three digits, and the a la carte approach to dining in the West culminated again in an experience that’s difficult for me to reconcile with Vietnamese food: every single person at the table was eating something completely different. My bowl of noodles was wedged between a dish of curry on the left and grilled beef with rice paper on the right. Across from me were fried frog legs, and at the end of the table was a pile of pork chops. When such radically different dishes are slung onto a table, the spirit of the food itself is lost. This week I scored big. In addition to finishing off a pint of burnt caramel ice cream, I found a dusty but still strongly bound first edition of Laughter on the Hill, a book about a young woman who moved to San Francisco alone in the winter of 1940. 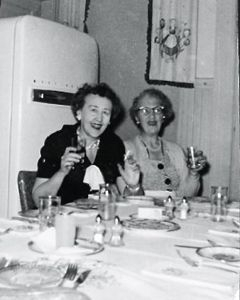 Grandmothers, 1955. Courtesy of San Francisco Public Library. For others who have adopted this city as their home, who have looked over the Bay and its bridges with awe, lived in a drafty dump of a flat that’s very well stocked with wine, or danced in the streets with strangers, this memoir will also strike a chord. It reminded me of other books that capture a special, specific time in the City’s history. 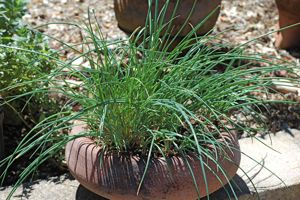 The pot of chives was waiting for me in Moraga. Little did I know there was an entire afternoon of wonder in store for me when I went to pick it up. With just his hands, a shovel and a wheelbarrow, 79-year old Ze’ev Vered has shaped seven terraces of gardens and orchards. Trees bearing pistachio, quince and pomegranate push up against the golden hills. A 6-foot cyclone fence that encircles his garden, to deter the insistent deer, has long been covered with the rambling vines of eight different varieties of grapes. The paths between each hand-weeded bed switch back several times, a steep trail that leads from one beautiful, delicious plant to another.